Did you know that everything is coming up purple this year? 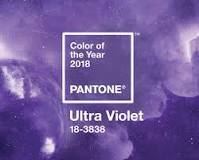 Last month Ultra-Violet was named color of the year for 2018. So if you have a February birthday, your birthstone of Amethyst fits right into this year’s color scheme. The cool thing about the color of the year, in general, is these colors seem to stay around as an influencer beyond the year they were selected for. So if you like the purple to the right, you should be able to find lots of things in that color this year. And if you don’t want to wear lots of purple. Or if you tend to wear mostly black, like me. You can pick up accessories with this color in them to update any look. But back to stones. Deep amethyst is the stone that most closely represents the Ultra-Violet color. You can also find purple naturally in Iolite, Tanzanite, Rubellite, Sapphire and Spinel gems as well as stones like charolite, chalcedony, fluorite and lepidolite. I am sure I am probably missing some here, and there are also a lot of stones that are now being dyed and treated to create purple colors. And if you don’t like purple, well you can just ignore it and pick up some of the other colors that being spotlighted this year. If you would like to see what is coming along in spring 2018 you can see the top colors at https://www.pantone.com/fashion-color-trend-report-london-spring-2018.